Cleaning and inspecting your RV roof periodically is highly recommended. Many RV's have a roof that is made from a long lasting type of rubber called Ethylene Propylene Diene Monomer. This type of rubber is semi-hard, and protects the roof from leaking. 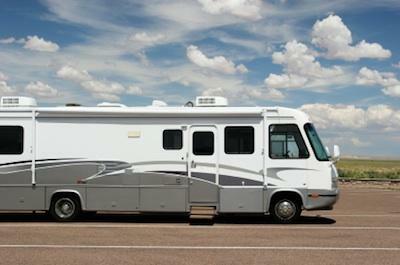 As you use your RV, or even store it, it may get covered with dirt, debris, sap, and bugs. Rubber RV roofs also develop a chalky layer as they age that needs to be removed so it won't run down the sides of the RV and leave white streaks. Cleaning the RV roof can prolong its life and keep your RV looking new. RV rubber roof cleaners are available from Camping World, Amazon.com, and many other traditional and online stores that carry RV camping supplies. It's important to note that EPDM is not all made by the same company. The actual length of time the roof on a particular RV is guaranteed to last will vary based on the warranty offered by the company that made it. Additionally, it's important to check the guarantee documentation that came with your recreational vehicle so that you can be certain that you are following the recommended maintenance procedures for your particular unit. Read the cleaning instructions and roof warranty documentation that came with your RV before cleaning. Your roof warranty normally covers the first 12 to 15 years. If you use the wrong cleaning product or clean the roof improperly, you may void your warranty. Once you are certain you have the correct cleaning supplies that will not damage your roof or void your warranty, you are ready to begin. Read the bottle of RV roof cleaner that you purchased and follow the instructions completely. After reading your RV owner's manual and documents on roof cleaning, you are ready to begin. The following instructions are based on safely cleaning an RV roof; they are very general and may not be specific to your particular RV. Wear shoes with a soft non-slip sole. Get a ladder and climb up on top of your RV. Sweep off the top of the roof. Inspect your roof for damage-if there is damage handle it as recommended by your RV owners manual. Spray your roof down with the proper RV roof cleaner. Wash the top of your RV with a long handled brush with a hose attachment. Turn on the hose attachment and scrub the RV roof while standing on the ladder. After the roof is cleaned and rinsed off, it is recommended to clean the sides of your RV as well. Seal your RV roof with a protectant only if it is recommended in your owner's manual. In addition to cleaning the roof of your recreational vehicle on a quarterly basis, it's a good idea to treat the roof with a coating solution, like Dyco Shield and Seal or Dicor Roof Guard, that is designed to protect it from the damaging effects of ozone and ultraviolet rays on an annual basis. Doing this can help keep the roof from becoming stained, resulting in a more attractive appearance and easier periodic cleanings.